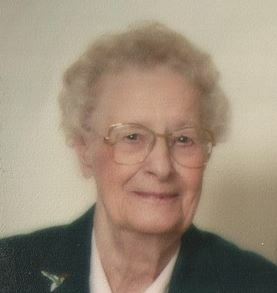 Mary C. Kessler (101) passed away April 5, 2018 at Presbyterian Manor in Newton, KS. She was born June 24, 1916 at Jewell, KS to Louis M and Annie Harrison Jorgenson. As a young girl, her family moved to Manhattan, KS, where she graduated from high school. She graduated Kansas State University in Manhattan, in 1938 with a degree in Home Economics Education. She taught in Topeka, KS until her marriage to Frank B. Kessler June 10, 1941. When Frank was drafted for WWII, Mary returned to teaching and in the summers she managed a canning kitchen for produce from Victory Gardens. In 1945, they moved to Hays, KS and she became a full-time homemaker as their children were born. In 1956, she returned to teaching at Fort Hays State College and then at high schools in Downs and Smith Center, KS. The family moved to Newton, KS in 1961 where Frank took over the family grain and livestock farm where he had grown up and Mary taught home economics at Santa Fe junior high until she retired in 1978. Mary was a member of Trinity Heights United Methodist Church and was active in the work of United Methodist Women. She was also a member of the Newton Area Retired Teachers Association, Harvey County Home Economics Club, and Newton Medical Center Auxiliary, having held offices in those organizations. A willing volunteer, she worked several years at Friendly Acres, now Asbury Park, initiating a crafts program for the residents and assisting with the annual bazaar. As a 4-H volunteer, she assisted with clothing projects. Working with the Newton Medical Hospital Auxiliary, Mary was chairman of the “Toys for Pediatric Patients”, coordinating making and distributing 135 toys annually. In her church, she enjoyed working on the annual church bazaars, making decorations for mother-daughter banquets, as well as serving meals there. In her later years Mary was active in Piece Makers quilting group at Trinity Heights and has made a quilt for each of her children, grandchildren and great-grandchildren. She learned watercolor painting at age 92 and created more than 200 paintings, some of which she sold and donated the proceeds to the Presbyterian Manor Scholarship fund. Survivors are a son, Alan F. Kessler (Karen) of Cedar Rapids, IA, a daughter, Arlys K. Nilles (Gary) of Verona, WI, a brother, Paul Jorgenson of Arlington, VA, 4 grandchildren and 9 great-grandchildren. She was preceded in death by her husband in 2006 and an infant daughter in 1946. A Celebration of Life will be at 11 AM, Saturday, April 14 at Trinity Heights United Methodist Church. Burial will be at Greenwood Cemetery at 10 AM on April 14. Visitation will be at Petersen Funeral Home 4-7 PM on Friday, April 13. Memorials are suggested to Newton Presbyterian Manor or Trinity Heights United Methodist Church in care of Petersen Funeral Home.